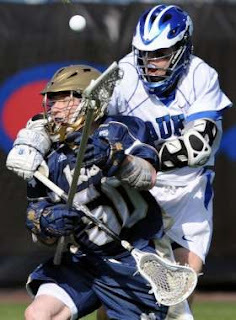 The inaugural Sunshine Classic Lacrosse tournament in Jacksonville, Florida boasted a variety of match-ups, but none like the rematch of the 2010 National Championship game where Duke defeated Notre Dame 6-5 in overtime. The game that aired live on ESPN this afternoon started off strikingly similar to the National Championship Game just 9 months ago. By the end of the first quarter, the score was still tied at zero. But by midway through the second quarter, Duke had a 2-0 lead on the Irish. However, that didn't last very long at all, as the Irish quickly answered with 4 goals in under four minutes and left the score 4-2 at halftime. The game was Notre Dame's from that point forward. The closest Duke ever got to Notre Dame again was in the fourth quarter when they closed in 7-5. But that quickly became 12-7 by the end of the game, and Duke's young team tasted bitter loss to their new rival, while Notre Dame celebrated defeating the team that cost them the title last year. Zach Brenneman, senior midfielder for the Irish, scored three goals and helped lead his team to victory in a major way. As sad as I am that Duke lost, I understand that they're a young team and can't expect last year's season to automatically repeat itself with so many players graduated (including my favorite, Max Quinzani). But my eye is on #12 (Justin Turri) this season, and he just so happens to wear my lucky number. The Irish outplayed the Blue Devils by a long shot, and they deserved to win this game.